I’ve always said there’s no secret to making money blogging. All the best bloggers I know make money because they write consistently for years and slowly build huge blog traffic through search and a following. There is one trick I’ve learned though that can be a huge boost to your monthly visitors. It can improve some of your best posts and can boost you to the first page on Google. 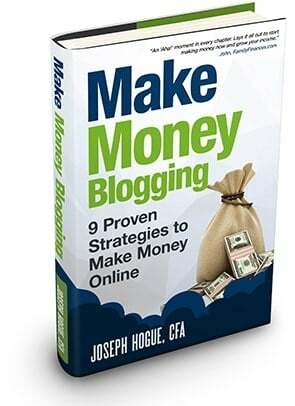 In fact, I started using this blogging secret in July of last year and have seen average traffic to each post surge by 246% and my monthly income has jumped from $318 to almost $2,300 last month. It’s called republishing and I almost don’t want to let the secret out. Ok, it feels like a secret but there’s actually a lot of bloggers doing it…just not doing it correctly. 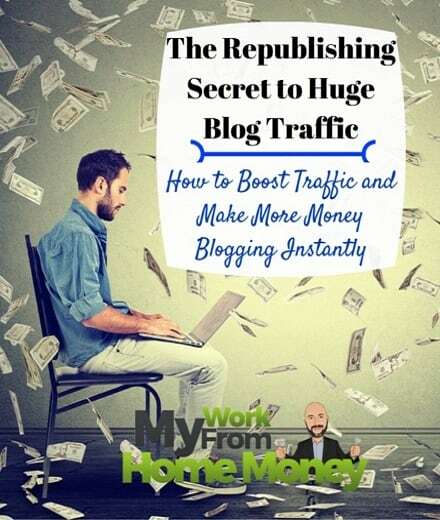 I’ll cover why republishing works so well in boosting blog traffic and then the process I use to get more visitors and make more money blogging. What is Blog Post Republishing? Your other option is to republish the blog post as a new article by clicking Edit and changing the date to current. You actually want to change the date to a few minutes into the future before you hit publish but we’ll get into why pretty soon. One more quick warning, don’t change the permalink URL to the post when you republish! I kept track of traffic to my republished posts through Google Analytics over the first four months of republishing. 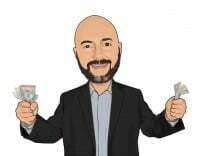 I still track which posts have been republished but have stopped noting the change in traffic…well because it’s such a huge boost in blog visitors that it could be half as effective and I’d still do it. When you track traffic to your republished posts, you’ll want to record 30-day views before republishing and then 30-day views after waiting a month. Don’t track views for the immediate 30 days following because those include a lot of direct and social traffic rather than mostly search visitors. Of the 20 posts I republished to two blogs, only three saw traffic declines while a few saw traffic increases of 500% or more. The average increase was 247% meaning that a post that got 100 visitors before republishing was getting 347 visitors afterwards. One post went from 67 views to 1,284 views after republishing! There are a couple of reasons why republishing posts works so well. Google has a recency factor in its search algorithm. We don’t know how strong it is but newer posts are favored over older content. Of course older content usually has more links so will do better but their search power will start to fade after a while. Republishing posts makes them look new to Google but they still have all the inbound links and search equity of the older post. Within the republishing process, you’re going to be going back through the post to update and improve it. Think about how much you’ve learned blogging and how much you could improve some of your earlier content. This means more content, better on-page SEO and a better reader experience. All of these contribute to a stronger search ranking for your post. Republishing also gives you a chance to increase the frequency of your content, another factor in Google’s search algorithm. A blog that updates frequently with new content is going to be crawled more by those beautiful Google spiders. There’s no formalized process for republishing blog posts but there are some things you can do to get a better Google boost and to make more money off your best blog posts. 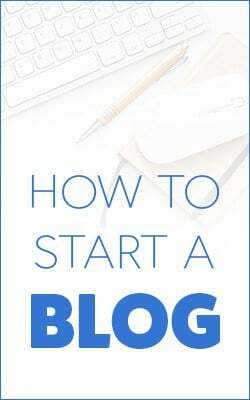 I know bloggers that basically just change the date on their post and republish, missing out on a huge opportunity for higher traffic and more money. It’s best to start with posts at least six months old and ones that are already getting a decent amount of visitors from search. Google Analytics is one source but the best way to find your pure search traffic is through Google Search Console (formerly webmaster tools). This should already be connected to your website by your developer but its easy to add your blog if not already done. When you login to your site on Search Console, you want to click ‘Search Traffic’ and then ‘Search Analytics’. This page will show you a mountain of great information on how you are ranking in Google. Click on the ‘Pages’ filter to show all your pages ranked on Google and click the ‘impressions’ and ‘position’ toggles. Pick one of your posts to republish and click on it, then click the ‘queries’ filter. This is going to show you each of the keyword phrases you rank on Google for that post, along with your average position and impressions. This is important because you’re going to go back through the post to keyword optimize it. This means making the post stand out in Google’s eyes as really authoritative content around a narrow subject. We covered how to get Google love for your posts through on-page SEO in our 10-page guide on how to start a blog. Now that you know for which exact keywords the post ranks, you can focus on a few of the big ones. Try adding a few keywords in the text and in the most important places below. Are there any places in the content where you can fit the keyword or a synonym? 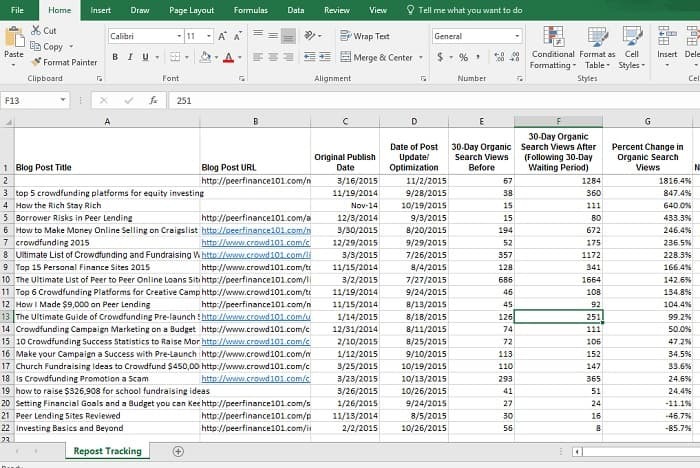 If you’ve got the Yoast SEO plugin, you’ll be able to track some of your on-page SEO improvements. You also want to read through the post and do any general updating and editing. You’ll be amazed…and maybe a little embarrassed at some of the mistakes you made on your first posts. Republishing gives you a chance to keep new readers from getting turned off on your blog from grammar mistakes and wonky sentences. The best part of republishing posts, beyond the huge boost to blog traffic, is the opportunity to go back through and monetize your most popular content. Ever heard of the 80/20 rule? Well in blogging it’s more like 10% of your posts account for 90% of your blog traffic each month. My top ten posts account for 67% of monthly traffic, you better believe I’m trying to make money off those ten articles. When you republish a post, add any affiliate links where appropriate. Don’t force it but there’s usually at least one affiliate that you can fit into the conversation by adding a paragraph or two. We covered getting paid to blog through affiliates and your own products in a recent post. Besides your best performing posts, try going back to republish your review posts of affiliates or other posts that are already making money. It’s just as easy making more money from a post that’s already converting than it is to figure out how to make money off a non-monetized post. When you’re done optimizing and updating the post, click Edit and change the publication date for a few minutes into the future. You don’t want to schedule it any more than a few minutes into the future because the URL will be inactive until it publishes. That means all the inbound links will be broken and webmasters might decide to unlink the post. Scheduling for a couple of minutes into the future gives WordPress enough time to schedule it but the inbound links won’t be broken long enough for anyone to notice. Treat the republished post just as you would any other new content. Share it out on social media and promote it to readers to get those social signals alerting Google that there’s a new post on the blog. 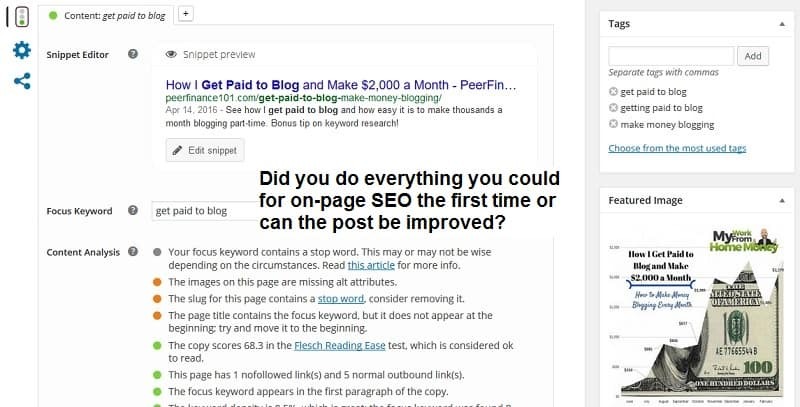 Republishing blog posts is just one step in my Google SEO process I use to rank for more than 1,700 keywords on the first page of Google. Too many bloggers avoid search engine optimization but it can be surprisingly simple if you take a little time to learn the process. You’ll boost your blog traffic fast, will start outranking larger blogs and will make more money. 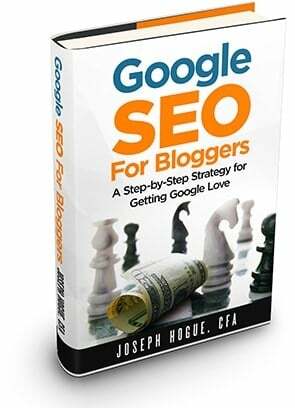 Check out Google SEO for Bloggers for the complete nine-part process to rank your blog in search and get the traffic you need to be successful! Don’t forget NOT to change the Permalink URL address! This is where all your inbound links and your search power points. Changing the post URL will break these links and you’ll lose your search ranking. Republishing won’t work if you have the date in your Permalink URL address. You’ll need to change your permalink structure on the blog first, redirecting all your old URLs to the new permalink structure. Content is king so don’t be afraid to add to your posts. You’re saving a lot of time by not having to write an entirely new post, spend a little of that time in making your republished post exceptional. Don’t rely completely on post republishing for blog traffic. Use the opportunity to increase posting frequency, maybe republishing one post a week and adding new content once or twice to really give your blog a boost. While republishing seems to work best on posts with a lot of search power, it can be a great way to improve any post and show new readers your best work. Thanks for this! I actually JUST updated my URLs (well, my IT guy did) so excited about this little tip. Thanks AJ, republishing is the only ‘secret’ I’ve found to blogging. Everything else is just good ol’ grunt work but republishing has been the easiest way to big traffic. Love to hear how it goes for your blog. Wow, I have definitely learnt something new today. It is the first time I thought/heard about republishing and I will be sure to make use of this tip, thank you! Thank you Joseph Hogue. This is a very new idea to me. It is true that with I have made many SEO mistakes. I have learnt a lot about on-page SEO, with you as well, in the mean time. I need to update those post. From your advice I will do it with change date. Please provide some help in reference to Blogger.com.